Gladiator Girl is featured in the January 2012 issue of Indie Firsts! eMagazine. Indie Firsts! is an innovative electronic publication committed to presenting the first chapters of selected eBooks. Indie Firsts! is available now for only $0.99 from Amazon for the Kindle, and in various eBook formats from Smashwords.com and Drivethrufiction.com. 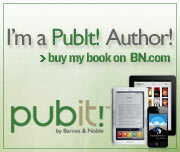 We're Finally Available for the Nook! It took forever—two and a half months—but the Barns and Noble Nook team finally got what-ever-it-was straightened out. Gladiator Girl went on sale in the Nook store last week. However, because I didn't have access to update the book file durning the delay, the version they had was out dated. The latest version fixes several small proofreading errors, and makes one significant change in the manuscript: The first two sentences of the book have been switched around. I updated the file last week, and as of today, this evening, the latest version is the one available. Nook owners, and Kindle owners will both be buying the same updated version. Although the Google ebook store has the new version, they have yet to update their store listing. Google seems to be getting their ebook store ready for the introduction of Android 3.0 powered tablets. Typical for Google, the Partner Program that lets small publishers and independent authors list their ebooks is in beta. The help topics are scattered, but one persistent afternoon was enough to figure out most of the process. The staff seemed responsive, both in the user forums, and in answering email questions, although answers took two or three days. The end result is right here, Gladiator Girl, Google ebookstore. On a side note, unfortunately, the Nook version is still trapped in limbo. Despite two months of helpful sounding email replies and pleasant conversations with eager service reps, the book is still "processing." Until this is resolved, Nook owners should be able to buy and read the Google version. I dropped some books off at House of Hero's Comics in Oshkosh. Scott had radically redesigned the store since I was last there. The coolest change was building new book racks on wheels so they can be moved out of the way for movies and special events. It's a great store. Very comfortable and warm place to shop if you are in the area. Heard from a couple of readers today. Both loved the book. One finished to discover it was 3 in the morning. The other, a trained martial artist, wondered how much research I put in to get the sword fighting right. The answer is, I made it up. My main inspiration was the 2003 movie, The Blind Swordsman: Zatoichi. I recall, on the DVD extras, writer / director Takeshi Kitano said he wanted the sword fights to be realistic and be over within moments of starting. It made sense, so I brought that idea into Gladiator Girl.